In times like these, every drop counts. By the time you read this, the North Bay could be awash in abundant winter rain, its reservoirs filling rapidly and groundwater being vigorously recharged. But maybe not. The rain gods might be holding back on meaningful precipitation once again, setting us up for a fourth straight year of severe drought. Six months ago, the State Water Resources Control Board approved emergency conservation regulations that require all urban water suppliers to step up conservation measures and enforce prohibitions on wasteful water use. In response, most North Bay cities and communities quickly rolled out restrictions on the hours when irrigation may take place, banned the washing down of driveways and sidewalks, and were given authority to fine property owners whose excessive watering habits result in runoff and overspray. Nearly everyone was asked to reduce water consumption by at least 20 percent. By September, many lush green lawns had turned the color of straw, while others had been creatively converted to xeriscapes requiring little or no irrigation. Efforts have been underway for years (between multiple water and sanitation agencies, engineers and consultants in the North Bay and beyond) to ensure the future of our drinking water supply. No matter how much rain falls here this winter, lessons learned during the last prolonged drought nearly 40 years ago will continue to impact current and future water conservation measures. As we’ve all been made aware, groundwater is scarce in many parts of California. Groundwater, which makes up nearly all of the available fresh water on our planet, is the water source for 13 million households on private wells in America, according to the National Ground Water Association. Most of the nation’s more than 40,000 community water systems are supplied by groundwater, and across the country, groundwater is used by agriculture at the rate of 53.5 billion gallons per day. Snow’s foundation claims groundwater is used to meet approximately 40 percent of the state’s water demands in an average year and up to 60 percent or more during drought years. Before the legislation became law, California was the only state in the nation without comprehensive statewide groundwater management programs, and property owners were able to pump as much groundwater as they desired without oversight. Additionally, the Russian River water supply system, managed and operated by the Sonoma County Water Agency, supplies water to about 80 percent of north Marin County and Novato customers and approximately 25 percent in the rest of Marin. Yet with surface and groundwater supplies being rapidly depleted, more needed to be done to stretch water supplies. “All up and down the state, people began to recognize that this is California, with a population of more than 38 million. Our limited water resources aren’t able to accommodate that many people and their multiple demands on the resource,” says Ginger Bryant, program development consultant for the North Bay Water Reuse Authority (NBWRA), a coordinated effort between Sonoma, Marin and Napa counties and 10 water and sanitation agencies working to address water supply shortages from a watershed perspective. NBWRA administers the North Bay Water Reuse Program (NBWRP), a series of existing and proposed pipelines designed to supply recycled water largely for crop irrigation and landscaping and to restore tidal wetlands and wildlife habitat (see “Purple Pipelines Carry Recycled Water,” below). Recycled water is former wastewater (sewage) that’s been treated to remove solids and impurities. The wastewater is sent from homes and businesses through a pipeline system to a treatment facility, where it’s treated to a level consistent with its intended use. The treated water is then routed directly to a recycled water system, through purple-colored pipes, so it’s used more than once before passing back into the natural water cycle. The Sonoma County Water Agency is one of the current members of NBWRA. 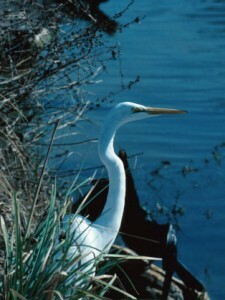 Other members include the county of Napa and Napa Sanitation District; the Las Gallinas Valley Sanitary District; the Novato Sanitary District and the North Marin Water District; the Marin Municipal Water District; the county of Marin (associate member); the Sonoma Valley County Sanitation District, and the city of Petaluma. Phase 1 of the North Bay Water Reuse Program has been under construction for five years and is comprised of $104 million in projects. Now at 65 percent completion, it includes foundational infrastructure for treatment, storage and distribution of recycled water. Phase 1 projects deliver this high-quality water for parks and landscaping, premium wine grape production and restoration of tidal wetlands and wildlife habitat. With so many North Bay agencies working together, it’s been easier to secure federal monies for these projects. The U.S. Bureau of Reclamation has provided 50 percent of the funding for the Phase 1 engineering, feasibility studies and environmental impact report, as well as more than $18 million in construction grants. Additional funding, approximately $6.5 million, has come from the California Department of Water Resources’ Proposition 84 grants. Local agency funds have been used to make up the balance. “With the water reuse program, we’re making investment strategies to stretch the supply we have before needing to take on more expensive projects that would cause huge spikes in water charges,” adds Davis. 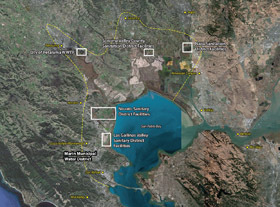 Last spring, the Marin Municipal Water District (MMWD) briefly studied the feasibility of a permanent pipeline to bring recycled water from the East Bay across the Richmond-San Rafael Bridge. During the drought of 1976 and ’77, six miles of pipeline were installed on the bridge’s upper deck to deliver fresh water from the East Bay. It was removed in 1982. Discussions about a new pipeline have come up recently, but a spokesperson for the water district says its board of directors hasn’t taken any action to pursue it and it’s not on the agenda for any board meetings in the foreseeable future. Meanwhile, some locations where water shortages are severe are looking at another alternative: highly treated wastewater that’s been cleaned so well (or purified using new technologies like reverse osmosis) it can be blended with groundwater and used for drinking water sources. “That’s already happening in places like Orange County, two small communities in Texas that ran out of water last year and three towns in Arizona that are considering its use,” explains Mark Millan, principal of Data Instincts, a consulting firm coordinating communications for NBWRA. This highly purified water first undergoes two levels of wastewater treatment and is then put through a series of processes such as microfiltration, reverse osmosis and ultraviolet light exposure so that it nearly matches—and, in some cases, exceeds—drinking water standards. A water district or utility in California would typically conduct an exhaustive environmental impact report first when considering going to this next level of water reuse.